1)The Purple Room-airdate October 25,1960-Rip Torn inherits Black Oak Mansion from his recently deceased uncle, but with one condition;he must live in the house for one full year. Patricia Barry and Richard Anderson (The Night Strangler , The Six Million Dollar Man) play his cousins who lure him into spending one night in the haunted Purple Room! 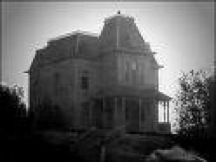 Black Oak Mansion makes use of Universal’s Psycho house. 2) Fingers Of Fear-aired Feb 21 1961-This disturbing and psychologically progressive episode deals with a child killer.It opens with a stark and chilling scene of an elementary school teacher chasing a ball (bouncing balls are usually foreboding of an impending shock! )from the playground only to discover the body of a mutilated little girl in the shrubs. The police start looking for an overweight brutish man, and a mentally ill man fitting the description starts to fear that he will be arrested for the crime. This starts a series of events that are filmed with a taut and thoughtful narrative until the shocking climax where the real murderer is caught. The final scene is quite disturbing when the killer violently attacks a doll, thinking it is a little girl. Directed by Jules Bricken, but could have been filmed by Sam Fuller. Highly recommend Fuller’s The Naked Kiss. 3)The Ordeal of Dr Cordell airdate March 7 1961-A doctor, Frank Cordell, played by Robert Vaughn ( The Man From U.N.C.L.E)trying to find the cure for nerve gas accidentally stumbles onto a chemical vapor that stirs a murderous uncontrollable rage in him, every time he hears a bell. 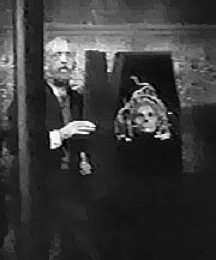 This episode taps into Robert Louis Stevenson’s 1886 short story The Strange Case of Dr. Jekyll and Mr.Hyde as Cordell modulates between these dueling personalities. 4) Parasite Mansion airdate April 25 1961-Pippa Scott plays a woman who wrecks her car, then gets shot at and faints only to awaken in an old dark house inhabited by an extremely strange family that are beset by the fear of a family “secret” in the form of violence that has plagued their home and family for three generations. Poltergeists,telekinesis,stigmata,alcoholism, insanity, backwoods vengeance and family dysfunction all play themselves out at the hands of Granny brilliantly acted by the incredible Jeanette Nolan, Beverly Washburn as Lollie ( Spider Baby ).Written by Donald S. Sanford and directed by Herschel Daugherty. 5) Mr George airdate May 9 1961-After a little girl loses both her parents, she is left in the care of her last remaining relatives, a sociopathic provincial trio who plan to kill her for her inheritance. But the child has a special guardian, a ghost named Mr George who is watching out for her safety at every turn.Written by Sanford, and directed by Ida Lupino. Virginia Gregg, Howard Freeman and Lillian Bronson as Adelaide the simple minded sister apropos of a Tennessee Williams character. The musical dynamic to this episode in particular is it’s own character within the plot. it seems to guide the narrative masterfully through a childlike lens. 6) Terror In Teakwood airdate May 16 1961-A concert pianist obsessed with being the greatest living pianist, takes extreme measures to improve his abilities.Guy Rolfe (Mr Sardonicus) plays Vladimir Vicek the tormented musician who goes to drastic and unholy ends to achieve greatness.Hazel Court plays Leonie his beautiful wife. Directed by Paul Henreid. Bette Davis’s love interest and doctor in Now Voyager. Perhaps my favorite film of the great Ms Davis! The theme is very reminiscent of The Hands Of Orlac . Also stars Charles Aidman. 7) What Beckoning Ghost airdate September 18 1961-Judith Evelyn plays Mildred Beaumont, a woman, yet another concert pianist, recovering from a heart attack,goes downstairs one night hearing a funeral dirge, and has a vision of her own dead body lying in repose in an open coffin.She faints and upon awakening is told by her husband and sister that she has started having memory lapses and hallucinations. Are they trying to drive her crazy or to her grave? Written by Donald Sanford from a story by Harold Lawlor first published in Weird Tales (July 1948) and directed by Ida Lupino. photo right Reggie Nalder from Terror in Teakwood. 8) The Premature Burial airdate October 2 1961-loosely based on Poe’s story, Sidney Blackmer (Roman Castavet the patriarchal warlock in Rosemary’s Baby ) plays a cataleptic man who suffers a seizure and is mistakenly buried alive. 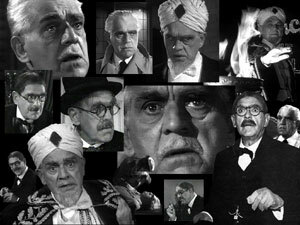 His doctor friend Boris Karloff breaks into the crypt and saves his life. After being revived by the galvanic battery! Blackmer becomes obsessed with this never happening again. However his young wife Patricia Medina and her artist lover Scott Marlowe are more interested in his inheritance. This episode has a wonderfully morbid tone to it. 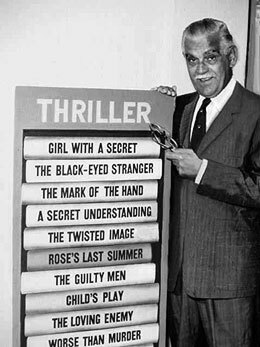 9) The Weird Taylor airdate October 16 1961-Writer Robert Bloch brings this macabre story to life directed by Herschel Daugherty. An abusive husband and bitter man, a tailor is asked to make a special suit of clothes for a wealthy man. The tailor doesn’t know that the man has accidentally caused his son’s death during one of his black mass rituals.The father’s only goal now is to bring his son back to life and having paid one million dollars for a rare book on sorcery which has the formula for creating a suit that if worn can bring back the dead!.George Macready is wonderful as the mournfully obsessed father.Henry Jones is Erik Conrad the angry tailor who doesn’t know what he’s getting himself into. 10) God Grante That She Lye Stille airdate October 23 1961-In 1661 a woman is burned at the stake for being a witch. She swears that her spirit will avenge her death. 300 years later,a girl descendant from the witch returns to her ancestral home and begins having to fight off the ghost of the witch who is now trying to possess her very body and soul! Henry Daniell plays Vicar Weatherford the descendant of the man who burned the witch 300 years prior. 11)Masquerade airdate Oct 30 1961-A young couple, a writer and his droll wife are on their honeymoon down south after being caught in a thunderstorm, stop at a house to seek shelter. This episode is laced with a lyrical quality and much campy humor.What they find, is a bizarre family led by John Carradine ( love him!) Jed Carta who taunts the couple with local stories about the Henshaw Vampire. Is the family a family of vampires?cannibals or just a bunch of psychopaths who kill wayward visitors for their valuables?Tom Poston as Charlie Denham, and Elizabeth Montgomery (Bewitched)as Roz Denham.The banter between the cast is so enjoyable. Pictured here John Carradine as Jed Carta sharpening his butcher’s knife. 12)The Return Of Andrew Bentley airdate Dec 11 1961-in 1900’s Ellis and Sheila Corbett arrive at the home of his Uncle Amos an occult enthusiast, who reveals that he is dying and plans on leaving everything to them as long as they remain in the house, never to leave and to keep vigil on his crypt in order to protect his eternal slumber from the mysterious Andrew Bentley and his minion demon that follows him around like a ghoulish pet.Written by Richard Matheson and directed by John Newland who also plays Ellis. Antoinette Bower is Sheila and Reggie Nalder is Andrew Bentley. Nalder is another actor with a very distinct face. 14) The Storm airdate January 22 1962-Nancy Kelly ( The Bad Seed’s mother ) as Janet Wilson after finding the body of a dead woman in the trunk in her cellar, is then stalked by a killer during one terrible stormy night! Directed by Herschel Daugherty. A few other of my favorite episodes are~Dialogues With Death, Well Of Doom ,The Last of The Summervilles , Hay Fork and Bill-Hook, What Beckoning Ghost,A Wig for Ms Devore and The Closed Cabinet!